This clay tablet with cuneiform writing is one of a dozen 4,000-year-old tablets in the collections of the Science Museum of Minnesota. 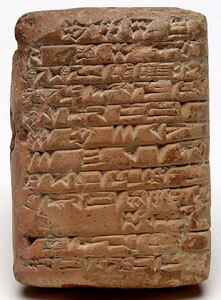 The Science Museum's cuneiform texts record economic transactions in ancient Mesopotamia, located where Iraq is today. Similar tablets were also used to record literary and civil texts, such as the Epic of Gilgamesh or Hammurabi's Code of Laws. Cuneiform means "wedge-shaped," referring to the end of the reed stylus used to form the cuneiform letters. Evidence suggests that preserved, systematic writing developed concurrently in three regions of the ancient world at the end of the 4th millennium BCE: Mesopotamia, Egypt, and the Indus Valley (Pakistan). Archaeological evidence illustrates that these three cultural centers traded with one another. It is likely that this cultural interaction contributed to the simultaneous development of writing systems. Current research on the origins and development of early writing systems has recently been published in the journal Science. See "Writing Gets a Rewrite," Science, vol. 292, no. 5526, June 2001.